Hey everyone! 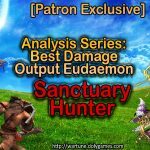 In this post I show and discuss about choosing rewards in Eudaemon War – a weekly Wartune Patch 7.5 dungeon. We can choose rewards? YES! Some players might be wandering what I am talking about, so here is a little explanation. I am certain there are people who do not know how to choose rewards and this is not their fault but, again, the fault of poor game design. 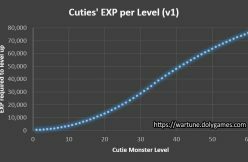 When you run Eudaemon War there is a possibility not to kill both mini-bosses per level in which case you will get the Extra Rewards. However, you will lose the 2nd not-killed boss reward and the final boss will be stronger because his buffs will remain in place. Thus there is a choice – to take Golden Sands and Dragon Blood Stones or to go for the Will Gears. Scenario 1 – killing all bosses: Each mini-boss drops 60 Golden Sands and 5 Dragon Blood Stones. 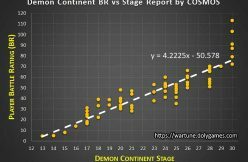 As there are 4 levels before the final boss this adds up to 2 x 60 x 4 = 480 Golden Sands and 2 x 5 x 4 = 40 Dragon Blood Stones. 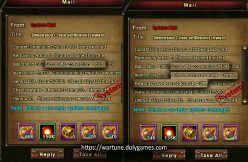 Then you also receive 120 Golden Sands and 9 Dragon Blood Stones making the total 600 Golden Sands and 49 Dragon Blood Stones. 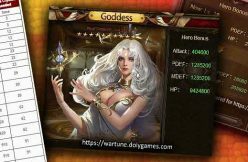 Scenario 2 – killing only 1 boss: here we get only 1 time the mini reward so the total is 1 x 60 x 4 + 120 = 360 Golden Sands and 1 x 5 x 4 + 9 = 29 Dragon Blood Stones and, since we protected the Extra Rewards we also get 4 x 30 = 120 Will Gears. I have prepared the illustration below for you where I show the rewards I receive from Endless Abyss blitzing until stage 13, which is below cashers but above average. We can see the earnings of 91 Will Gears and this is a daily yield. So over the course of 1 week this would be 7 x 91 = 637 Will Gears. I would say that we have a choice between short and long term improvement. The Eudaemon equipment has an enchantment limit, so once it is maxed out then the Gold items are no longer useful. Additionally, the added stats are not entirely impressive. So from this aspect one might recommend going for the long term planning and maximizing Will Gear income of Scenario 2. On the other hand there are a lot of players who are far away from Willpower or are simply not interested in the available Willpower types. These players naturally cannot use Will Gears at all. So if you are in this group probably you should focus on Scenario 1 rewards. 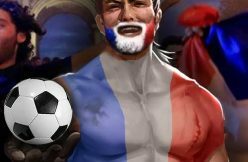 I also know that some players do half half as they are having a hard time to decide (for whom I hope this article will be especially useful). Each 30 piece of Will Gear from Extra Rewards is directly connected to each mini-boss level. Therefore you can cherry pick which ones to take and which of the final boss’s buffs to deactivate if he is too difficult for you. 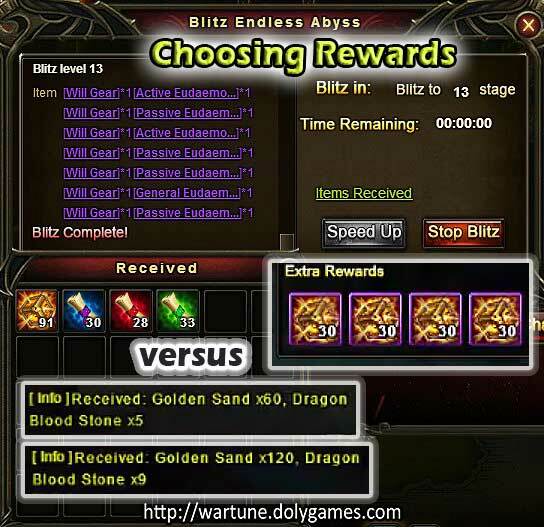 However, when comparing the Will Gear yield of Eudaemon War versus Abyss we can see that it is only about 19% and less over time (as we conquer more Endless Abyss stages), so I would recommend for most players to bypass the Extra Rewards and go for Scenario 1 (killing all bosses) until at least 1-3 of your main Eudaemon(s) / Willpower(s) are fully maxed in Gold. After this your interest in Golden Sands and Dragon Blood Stones should diminish and we can focus on Scenario 2 to increase the Will Gear income a little bit. 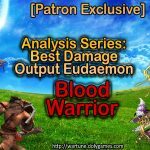 Which Scenario do you prefer in my article Analysis of Choosing Rewards in Eudaemon War? Killing all the bosses makes the most sense for almost everyone. The equipment enchants may not be that big a bonus, but the refinements are substantial – bigger than the slotted diamonds even at level 12. Anyone who already cashed enough to get their gold equipment upgraded obviously would want the extra gears, but for them, the amount of extra is probably pretty minimal anyway. Thank you Cosmos. This article was very helpful and well written. It explained the choices nicely. It takes 1800 golden sands to fully upgrade all equipment on one eudemon, that means 3 weeks killing all bosses or 5 weeks killing 1 per level. Given how quickly the gear is going to get maxxed out regardless of which you choose I think it makes most sense to go for the long term option of will gears which you are still likely to be needing in a year. Resistence seem to be the primary reason that eudemons die so quickly so boosting resistence on the willpowers as quickly as possible seems to make the most sense too me in order to get them useful quicker, not much point to a eudemon with great gear if it gets one shot all the time, if a eudemon lasts long enough to actually be useful then then most of the time you are likely to be a decent amount bigger than your opponent and so would win anyway. Gears are easier to get from that as the first 10 lvls can be beat by any player with lvl 10 euadaemons. Gear enchant/refinements are fixed stat items meaning as the Eudy grows the percent of effect diminishes. I have noticed a fairly large group of players are more focused on there is a reward to make something than goal oriented to what actually makes a toon stronger. I think the question to ask is what gets me further gains over some window of time than the question of I want that max gear. 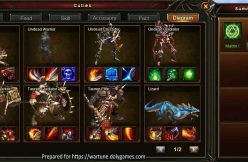 Wartune is notorious for giving out resources at a rate so low as to the items they make is obsoleted well before they can be made even by the high spenders. Diamonds and Divinity is a perfectly good example of that. To max out 3 sylphs with fused level 12 divinity you need approx 453,000,000 level 1 divinity. We all been working on it for 3 years. 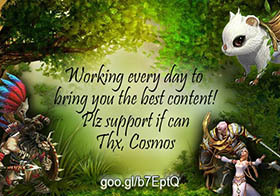 We get anywhere from 5 – 20 a day depending on toon level. Let’s assume 20 a day, that is 85,400 years to completion. Taking into approx. account for leap year and make 1 get 1 events or course. 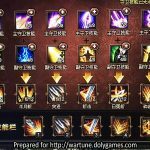 Holy Sword resources are coming faster so as the holy sword level increases the growth amount from divinity decreases. Full fused divinity offers 48k BR to a sylph, at a sylph that is 500k br that is 9.6% but as the Holy Sword takes the sylph to 3M br that’s 1.6%. I bet you get the Holy Sword completed thousands of years before divinity is completed. Eudy gear/refinements/enchanting is even worse than the sylph example. Gear offers far less growth to an eudy, Diamonds were obsoleted over a year ago as they growth offered is too low to be useful. Maxed gear refinements/enchant/diamonds = 215,720 BR total but white is 53,930 BR, the increase from white to orange is +161,790 BR. Now consider that you likely already have purple gear or non-enchanted orange, this increase will offer only about 0.7% that diminishes with time as it is fixed stats. I suggest not putting time/effort or resources into something that is diminishing and put the time/effort/resources into what is increasing the diminishing stuff will come with time anyway. Everyone over the next year or so will have a 28M BR eudy! I would also note that EXP on the merged eudys only feeds battle protection(BP) which adds a lot of fluff BR. Most want the BR in whatever form it comes. Will gear from Eudy War is what is used here. Costs have been very high on eudy gear growth with gains very low, I would focus on willpower EXP growth which offers far greater returns. In Eudy war going after the lesser offering that seems greater while sacrificing the greater offering may need a bit of thought. We are only talking a few weeks on gear to gain more will gear. We waited years for eudy gear, what’s another few weeks! This is a strategy game, there is a lot to strategy. All aspects of growth should have a strategy. An example I sort of watch on multiple servers I somewhat find funny. To each their own of course but everything has a cost/gain. I see a fair percentage of players building and talking about how to do well in Sylph Exp but at what cost, the cost is things like Time Portal or do good in arena and sacrifice Time portal or something. Gain a few extra level 1 divinity while sacrificing Holy Sword growth. I suppose many have wallets that are too thick anyway. The Jones’s will usually wave as they cruse past looking at your name in lights with their more effective strategy! Personally I typically prioritize high gains with toon growth/ability. Actual growth vs fluff. As toons get greater the ability to tune gets lesser. Everything in the game has gains/sacrifices. What are you sacrificing? Are you higher gain or higher sacrifice? They do heal well but healing does not kill the ememy it only makes us hit the enemy less times than they hit us. 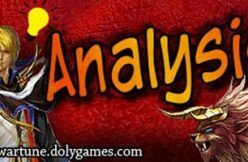 Thank you for sharing your analysis and suggestions. For me it was an interesting read and I hope for others will be as well. In the future I suggest you email me such big texts and I can post it as an article which is I think a better format for this.